As the fall season gets started, many Americans will head to a farm or apple orchard to pick apples. This is a very common American tradition since it's a fun activity to do with family or friends and apples are especially delicious fresh and in season! Apples are a very healthy and popular American snack. They can also be used in a variety of ways—you can eat them fresh, add to recipes like salads, and cook them. Apple pie and apple cobbler are delicious and traditional American desserts. Many recipes, particularly baked goods and desserts, call for apples so this is a great (and fun!) way to get some in bulk at a reasonable price. Don't just stop at apples! 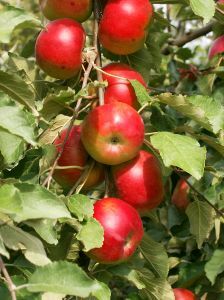 Many orchards are part of larger farms, which may offer a variety of other fruits, vegetables and produce available for purchase. You can come home with a whole assortment of goods. Try to get a pumpkin or two to carve if they are available—pumpkin carving is another great fall activity enjoyed by individuals across the U.S. It's especially popular as it relates to Halloween, a holiday celebrated in the U.S. on October, 31st.